With a well-built and extensive road & track network, the state of Himachal Pradesh offers a steady adventure opportunity to vacationers. Opting for a jeep safari is one of the best ways to pass across the ethnic villages and hamlets of the state that showcases the inner beauty of this northern jewel that lies at the foothills of the Himalayas. Moreover, it can be one of the best options to explore the natural and man-made highlights of the state. So give a perfect start to your Himachal sojourn and enjoy a jeep safari covering roads that lead to a whole new route with every turn. The roads that were cut down from rocks will really amaze you with their rock cut structures on one side and deep down region that goes down to great height on the other. Tourist can travel to some of the famous destinations of the state Manali (Rohtang pass), Shimla (through Kinnaur), Spiti and Lahaul (Kunzam Pass) with Jeep safari. 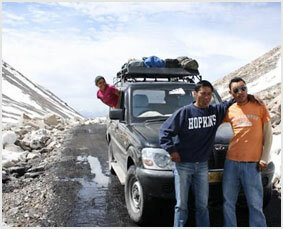 Moreover, if you wish for something more, then get ready to access the enticing highland of Leh and Ladakh from Lahaul. Travelers can also find an array of customized jeep safari that can add up to their Himachal vacation plan. From short jeep to long journeys explore each and every highlight of the state. Jeep safari in Himachal Pradesh lets you experience each and every bit of the state in the most amazing manner.